Dimethylmercury ((neurotoxins. It is described as having a slightly sweet smell, although inhaling enough vapor to detect its odor would be hazardous. The molecule adopts a linear structure with Hg-C bond lengths of 2.083 Å. Whereas dimethylmercury is a volatile liquid, CH3HgCl is a crystalline solid. Dimethylmercury currently has almost no applications because of the risks involved. As with many methyl-organometallics, it is a methylating agent that can donate its methyl groups to an organic molecule; however, the development of less acutely toxic nucleophiles such as methylmercury cation was bonded to the target molecule, forming potent bactericides; however, the bioaccumulation and ultimate toxicity of methylmercury has largely led it to be abandoned for this purpose in favor of the related ethylmercury cation, which perform a similar function without the bioaccumulation hazard. In toxicology, it was formerly used as a reference toxin. It has also been used to calibrate NMR instruments for detection of mercury, although less toxic mercury salts are preferred. Dimethylmercury is extremely toxic and dangerous to handle. Absorption of doses as low as 0.1 mL can result in severe mercury poisoning. The risks are enhanced because of the high vapor pressure of the liquid. 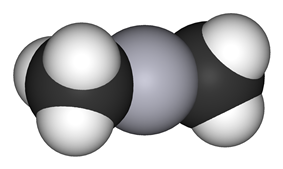 Dimethylmercury passes through latex, PVC, butyl, and neoprene within seconds, and is very quickly absorbed through the skin. Due to its chemical nature, it carries with it a high aptitude for its effortless ability to pass through the same safety equipment and barriers that prevent lab accidents such as direct bodily contact (skin; eyes; oral) that have proved to be adequate protection for a majority of laboratory chemical substances. Therefore, due to its high efficiency in penetrating skin barriers, the most common gloves used in a majority of laboratories and/or clinical settings do not provide adequate protection from dimethylmercury. It's widely understood and accepted that the only safe precaution is to handle dimethylmercury while wearing highly resistant laminated gloves; adding long-cuffed neoprene or other heavy-duty gloves over the first pair. Also indicated when handling this highly dangerous substance, is the consistent use of a long face shield, added to the safety measure of working under a fume hood. Dimethylmercury crosses the bioaccumulate. The symptoms of poisoning may be delayed by months, resulting in many cases in which a diagnosis was ultimately discovered, but only at the point in which it is often too late for an effective treatment regimen to be successful. The toxicity of dimethylmercury was highlighted with the death of the inorganic chemist Karen Wetterhahn of Dartmouth College in 1997. After spilling no more than a few drops of this compound on her latex-glove, the barrier was immediately compromised and within seconds it was absorbed into the back of her hand, quickly circulating and resulting in her death ten months later. ^ "dimethyl mercury - Compound Summary". PubChem Compound. USA: National Center for Biotechnology Information. 16 September 2004. Identification and Related Records. Retrieved 10 March 2012. ^ O'Halloran, T. V.; Singer, C. P. (1998-03-10). Hg Standards"199". Northwestern University. Retrieved 2012-05-24. ^ Hoffman, R. (2011-08-01). "(Hg) Mercury NMR". Jerusalem: The Hebrew University. Retrieved 2012-05-24. ^ "Delayed Toxic Syndromes" (pdf). Terrorism by Fear and Uncertainty. ORAU. ^ a b c d "OSHA Safety Hazard Information Bulletin on Dimethylmercury". Safety and Health Information Bulletins (SHIBs), 1997-1998. OSHA. 1991-02-15. ^ Cotton, S. (October 2003). "Dimethylmercury and Mercury Poisoning. The Karen Wetterhahn story". Molecule of the Month. Bristol University. ^ a b "The Karen Wetterhahn story". Retrieved 1 September 2014.